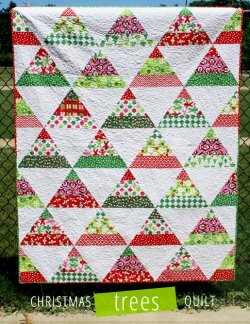 "I had so much fun playing with these fun and festive Jingle and Remix prints to make the Christmas Trees Quilt. I especially couldn’t resist my favorite print: penguins wearing red and white scarves on a bubble-gum pink background! This simple quilt pattern I have created allows these fabrics to shine and the strip piecing method I used ensures quick construction. Users of this pattern should know that this pattern generates a fair amount of scraps – especially if you decide that you want a wide variety of prints in your quilt top. You can decide to make the quilt bigger (or smaller) and use the scraps for another project."